You Are Here: Home > 2018 Jeep Wrangler JL – Colorado Springs CO.
2018 Jeep Wrangler JL – Colorado Springs CO. There is a reason the Jeep Wrangler has been around in one form or another since World War II. When it comes to unparalleled performance off-road where the terrain is unforgiving, the Wrangler’s beefy suspension, modular design, and powerful drivetrain options make it a force of motion and torque. That is the reason so many people have used this off-roader for weekend getaways, commercial jobs, and even military operations. 2018 has brought a new Wrangler into the fold as the 2018 Wrangler JL. As the fourth (and now current) generation, this new beast offers plenty of upgrades and improves on a platform that already has a lot going for it. Why the new model? Jeep long ago realized that what works for one year or generation probably won’t in the future. To stay ahead, you need to keep innovating. Building on the successful recipe for modularity and performance, the JL modernizes the exterior and interior features of the vehicle. 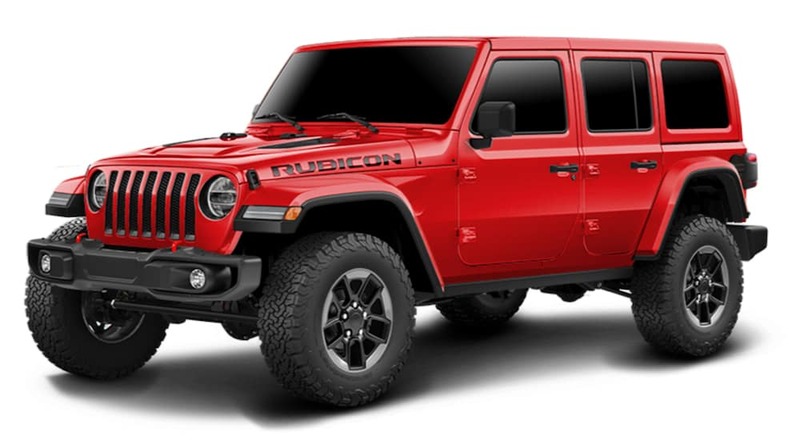 You will still recognize it as a Wrangler, but the extra amenities and interior features will give the vehicle a new life to enjoy the outdoors while remaining competitive with other modern cars on the roads today. Here’s a look at what you can expect. No one has ever mistaken the Wrangler for a concept SUV, but Jeep has done a good job of modernizing many of the exterior and interior features to give this vehicle a great update. The design remains mostly the same with little tweaks to the grill, headlights, and soft top roof. For those who purchase the convertible version, you will find the Sunrider soft top to be free of complicated, often binding zippers. The convertible also comes with a fully powered canvas roof option that slides open or closed at the touch of a button. The real changes to the exterior are just beneath the surface. An all-new steel frame is heavily braced for extra abuse and impacts while off road. Dana front and rear solid axles will keep the vehicle going while absorbing the punishment of rocks and potholes alike. To save weight, the Jeep designers started using a lot of aluminum and magnesium accents. Lighter hoods, fenders, anti-roll/track bars, and more keep weight down as much as possible using these materials. True to the Wrangler’s design creed, the 2018 version continues the trend of modularity on the outside. Remove the doors, windshield/windows, top, or accessories to tailor the vehicle to your liking or next adventure. The Wrangler’s impressive range of accessories extends to the 2018 version as well so you can carry whatever gadgets, toys, or containers you need to survive out in the wild or the city alike. The Wrangler has never had a luxurious interior like other, more expensive SUVs, but it does provide enough design and style to remain comfortable. Interior perks include an all leather design on the seats, wheel, and certain areas of the dashboard. Since they know this vehicle will be running through water, mud, snow, and other messy things, Jeep has made the interior completely waterproof. This way, you can have your adventures without replacing the interior each time you return. The JL comes with a few modern interior amenities such as a standard heater and AC system. The infotainment system includes a center LCD screen on the dashboard. This system can control basic functions like the music, optional navigation, and provide detailed information about the vehicle’s current status and performance. For safety, Jeep has done a good job of keeping this vehicle modernized with intelligent, active safety systems in addition to the beefy frame and roll bars. Multistage airbags around the front and side are standard for front passengers. Systems designed for challenging driving conditions include ABS, all-speed traction control, electronic stability control, and descent control. All of these systems help the driver to maintain control of the vehicle while protecting all of the occupants in the event of an accident. Active safety features include Jeep’s extended range of intelligent additions to increase driver awareness. Blind-spot monitoring, a rearview backup camera, and parking sensors will all keep an eye or provide a new perspective on the vehicle’s hard-to-see areas. The infotainment system allows for voice control with personal assistants like Siri to offer hands-free interaction while the vehicle is in motion. The security system includes an alarm, remote key engine immobilizer, and keyless entry. Under the hood, the Jeep Wrangler JL has plenty of options for people to choose their preferred level of performance and torque. The base engine is a Pentastar 3.6L V6 that can produce around 285 horsepower and 260 pound-feet of torque. Transmission options range from a standard six-speed manual gearbox or an eight-speed automatic transmission. A new addition to the 2018 model is a turbocharged 2.0L I4 with eTorque assist. While offering less power of around 268 hp, this engine model is designed for individuals wanting more torque at their fingertips. A separate electric motor connects to the engine via a belt-drive to deliver an instant punch of torque whenever needed. The electric components use standard hybrid technology such as smart battery monitoring/control, regenerative braking, an automatic torque assist. Down the road, the four-door Wranglers will also receive a diesel engine option in the form of a 3.0L V6 found in some modern pickup trucks. The engine only clocks in at 260 horsepower but offers the most torque with 442 pound-feet. Anyone wanting to maximize the four door’s 3,500 hauling capacity or traction up tricky hills will want to pay attention to this version. The new 2018 Jeep Wrangler JL comes with the same variety of options and body styles as previous versions. This creates a buffet of options for potential owners to choose from to tailor the vehicle to their liking. Since many Wranglers are preferred as a premiere off-roader, many of these features are still oriented towards the harsh environment natural terrain can provide. The primary styles include a two and four-door model for easier rear access. The overall length remains the same since the two-door version still seats rear passengers without the extra door access. Like previous versions, the JL also comes with a convertible option to feel the open road or get outside access quickly when necessary. The trim levels of the Wrangler remain mostly the same with basic options ranging from the two-door Sport, Sport S, and Rubicon and four-door Sport S, Sahara, and Rubicon trims among the available levels. Many features are standard across all of the trims, including high-performance head and fog lamps, push-button start, skid plates, side airbags, and a backup camera. Anyone wanting to pull around some cargo will appreciate the optional towing package which adds a Class II hitch receiver, wire connections/adapters, a 700-amp battery, and an electronic trailer-sway control (this last feature is standard). The two-door version has a tow rating of around 2,000 pounds while the four-door increases the max to 3,500 pounds.